Continuing west on the Angels Camp Bypass we come to the Penstock Bridge (30 0055) with the penstock on the ground between the piers. 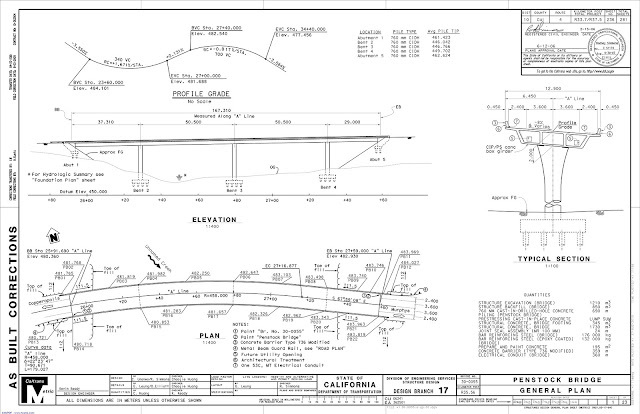 It's a four span cast-in-place prestressed concrete box girder bridge as shown in the plan drawing below. The bridge was drawn in 'metric' during the brief period before we decided we preferred US units. The bridge is 548 ft long with two 166 ft long center spans. Calaveras County, California Bridges: State Route 4 across Penstock Viaduct by Mark Yashinsky is licensed under a Creative Commons Attribution-NonCommercial-ShareAlike 3.0 United States License.